Did you catch last Sunday’s Countryfile? 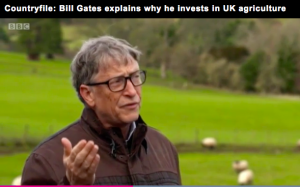 Were you shocked to see Bill Gates pop up, clad in wellies and surrounded by sheep talking to Tom Heap about why the Bill & Melinda Gates Foundation is investing in British agricultural research expertise? Britain has some of the oldest and most esteemed agricultural research establishments in the UK and they seem to be gaining some international recognition, according to Countryfile. On an interview captured during Bill Gate’s recent visit to the Roslin Institute in Edinburgh, in which efforts to address challenges around livestock health and productivity were discussed, Bill explains his decision to invest millions of pounds in the UK to help the lives of some of the poorest farmers in the world. Gates made clear that his foundation is looking to make sure its investments impact the poorest, clarifying that insights gained from research in the UK have global operability. The Roslin Institute event that Gates was attending saw the Secretary of State for International Development, Penny Mordaunt, announce an investment of £4 million from the Department for International Development (DFID). This funding will enable scientists in Scotland, Africa, Australia and the USA to tackle challenges faced by livestock farmers in sub-Saharan Africa. It will support research in the Centre for Tropical Livestock Genetics and Health – a joint venture between The Roslin Institute, Scotland’s Rural College (SRUC) and the International Livestock Research Institute (ILRI) in Kenya and Ethiopia. Building on a £10m award from the Bill & Melinda Gates Foundation, supported by matched funding from these partners, it illustrates the type of momentum a development such as ARC could trigger in Cambridge, a city also recognised internationally for its abundance of academic, agricultural, life science and technology expertise.